A serving of about 1-1/4 cup is about 300 calories. 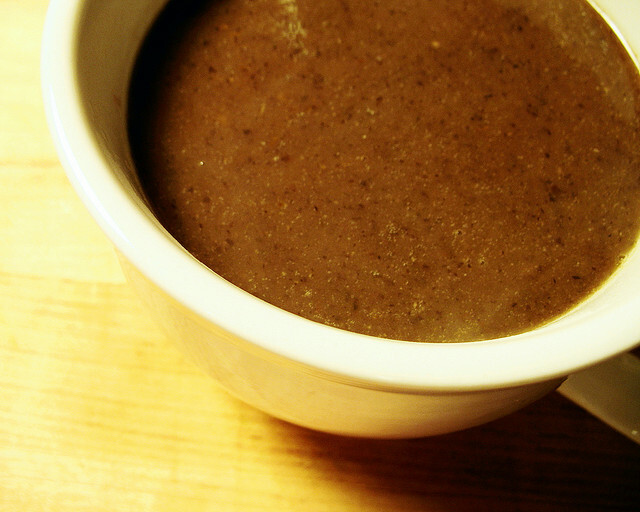 There are many quick versions of black bean soups out there. A few years ago, I started putting the following ingredients together and think it’s pretty tasty. Beans are great for weight loss. On average, people who eat beans weigh 6.6 pounds less than those who do not eat beans. Beans (and lentils) are low in fat and are cholesterol-free. One cup of cooked black beans which are about 225 calories have one gram of fat, fifteen grams of protein, and fifteen grams of dietary fiber! Believe me, that’s going to fill you up in a healthy way! Heat a large saucepan over medium-high heat. Add a small amount of vegetable broth and the onion; cook about 5 minutes, stirring occasionally. Add garlic, carrot, and celery; cook until soft about 5 minutes. Add the rest of the broth, beans, and cayenne pepper; simmer uncovered 10 minutes.Stir in vinegar. Transfer to blender or food processor; process to desired consistency. Reheat if necessary. If you have a Vitamix, after you saute the vegetables, put everything into our Vitamix and blend for about 10 min or until steam escapes from the lid. For some additional variety, I sometimes add two to three tablespoons of chunky salsa, or three or four slices of avocado or a sprinkle of non-dairy cheese or nutritional yeast.